Reçu le 22 juillet 2017, accepté le 21 septembre 2017. L’aire de répartition native de l’abeille domestique couvre l’Europe, l’Afrique et l’ouest de l’Asie. Toutefois, les activités humaines ont étendu la répartition de cette espèce, de manière telle qu’actuellement cette abeille est présente sur tous les continents, sauf en Antarctique. En parallèle de cette expansion, l’homme a remodelé la diversité génétique des populations d’abeilles. Nous examinons ici l’impact de la gestion humaine sur la diversité génétique des populations d’abeilles domestiques. Nous nous concentrons sur quatre facteurs principaux : (1) les importations d’abeilles, (2) la domestication et la sélection, (3) le déclin/développement des populations sauvages, et (4) les facteurs socio-politiques, économiques et culturels. Globalement, la gestion humaine a entraîné une augmentation de la diversité génétique des populations d’abeilles, au travers de leur ‘mélange génétique’. D’un autre côté, les populations de nombreuses sous-espèces natives ont été génétiquement mélangées, ce qui peut mener à une perte d’adaptations locales. Plus d’efforts devraient donc être consacrés à la conservation de ces sous-espèces. Enfin, nous discutons pourquoi les populations mélangées génétiquement peuvent représenter une source de nouvelles adaptations. The native distribution of honey bees covers Europe, Africa and Western Asia. However, human activity has expanded the distribution of this species, so that currently honey bees are present on all continents, except Antarctica. In parallel of this expansion, human has reshaped the genetic diversity of honey bee populations. Here, we review the impact of human management on the genetic diversity of honey bee populations. We focus on four main factors: (1) the importations of honey bees, (2) the domestication and selection, (3) the decline/development of wild and feral populations, and (4) the socio-political, economic and cultural factors. Globally, on one hand, human management leads to increase the genetic diversity of honey bee populations through admixture. On the other hand, the populations of several native subspecies have been genetically admixed, which might lead to a loss of local adaptations. More efforts should therefore be dedicated to the conservation of these subspecies. Finally, we discuss why genetically admixed populations may represent a source of new adaptations. Admixed populations – new source of adaptations? 1The honey bee, Apis mellifera L., is a key species in many ecosystems, ensuring the pollination of several crops and wild flowers. With the contribution of other pollinators, this species generates considerable incomes for the agricultural sector. For the crops directly used for human food, the annual economic value of insect pollination was estimated to €14.2 billion in Europe (Gallai et al., 2009). This value worldwide reached €153 billion, which correspond to about 9.5% of the value of agricultural production for human food. The recent decline of A. mellifera in many regions of the globe is therefore particularly troublesome, for the stability of agricultural yields, but also for the conservation of biodiversity (Allen-Wardell et al., 1998). 2Among the pollinators, the honey bee is currently the only one which can be moved and managed so easily (vanEngelsdorp et al., 2009). The domestication of A. mellifera has therefore enabled to better bring together demand and supply for pollination services. In the USA for example, migratory beekeepers move their colonies over thousands of kilometers to enable the pollination of large areas of pollinator-dependent crops (Delaplane et al., 2000). 3Despite this ability to move honey bee colonies, there is still a substantial mismatch between supply and demand for these pollination services. Over the last five decades, the global stock of domesticated colonies only increased by 45%, which was insufficient, compared to the much faster increase (>300%) of crops depending on animal pollination (Aizen & Harder, 2009). In Europe, this mismatch was still aggravated by agricultural and biofuel policies encouraging the growth of insect-pollinated crops (Breeze et al., 2014). In addition, many regions of the globe have suffered high colony losses during this period. In the USA, the number of managed colonies has decreased by 59% between 1947 and 2005 (National Research Council, 2007; vanEngelsdorp et al., 2009). Similarly, in Central Europe, the number of managed colonies has dropped by 25% between 1985 and 2005 (Potts et al., 2010). This situation was still exacerbated by the decline of wild pollinators in some European countries (Biesmeijer et al., 2006). In this context, increasing the number of honey bee colonies should be considered as a priority in several regions, in order to sustain the pollination of crops and the conservation of biodiversity. 4However, this goal of increasing the number of colonies should be achieved without threatening the diversity of local honey bee populations. For example, massive importations of colonies and queens might affect the genetic diversity of local populations, and even bring new pathogens. The current context shows that socio-economic interests have often taken precedence over the conservation of native subspecies (Lodesani et al., 2003; De la Rúa et al., 2009; Meixner et al., 2010). As a result, genetically admixed populations became the norm in human-dominated landscapes. 5The current diversity found in A. mellifera stemmed from the evolutionary history of this species. Two main hypotheses were drawn regarding the origin of this species. Multiple studies argued for an origin in the Middle-East, based on morphometrics (Ruttner, 1988), or based on mitochondrial DNA sequence (Garnery et al., 1992; Arias & Sheppard, 1996). Others authors concluded to an African origin, using genome-based single-nucleotide polymorphisms (SNPs), i.e. single base-pair differences (The Honeybee Genome Sequencing Consortium, 2006; Whitfield et al., 2006). The results of this latter study were reevaluated by Han et al. (2012), who showed that the robustness of their analysis does not allow to draw any definitive conclusion. Currently, the Middle-East origin remains the most probable and well-supported hypothesis; closer to the nine other Apis species, all restricted to Asia. A recent study confirmed this hypothesis, based on a much higher number of SNPs (Wallberg et al., 2014). 6From this origin, the species expanded into Africa, Europe, and Western Asia. Most studies on the origin of A. mellifera, mentioned above, agreed on an expansion through four main lineages, traditionally called A (Africa), M (western and northern Europe), C (southern and eastern Europe) and O (Middle East and Western Asia) (Figure 1). Previous molecular dating evaluated that the separation of the lineages occurred about 1 million years ago (Garnery et al., 1992). However, Wallberg et al. (2014) suggested that this separation could be more recent (i.e. 300,000 years ago). This latter study also estimated that the split between subspecies, within each lineage, probably occurred 13,000-38,000 years ago. As the authors pointed out, this period corresponds approximately to the last glacial maximum. At this period, the isolation of the four groups (A, M, C, O) and their postglacial colonization initiated the separation into subspecies. A similar scenario was already observed for other species at this period, such as the grasshopper Chorthippus parallelus, the brown bear Ursus arctos, and the house mouse Mus musculus (Hewitt, 2000). Overall, 29 A. mellifera subspecies have currently been identified, based mainly on morphometrics (Ruttner, 1988; Engel, 1999; Sheppard & Meixner, 2003). It is unclear how accurate this number is, since multiple ecotypes were previously defined as subspecies – because they resulted from the high phenotypic plasticity of a single subspecies (Gruber et al., 2013; Wallberg et al., 2017). Overall, the main differences across subspecies resulted from geographical isolation and adaptations to their respective environment (Figure 1). 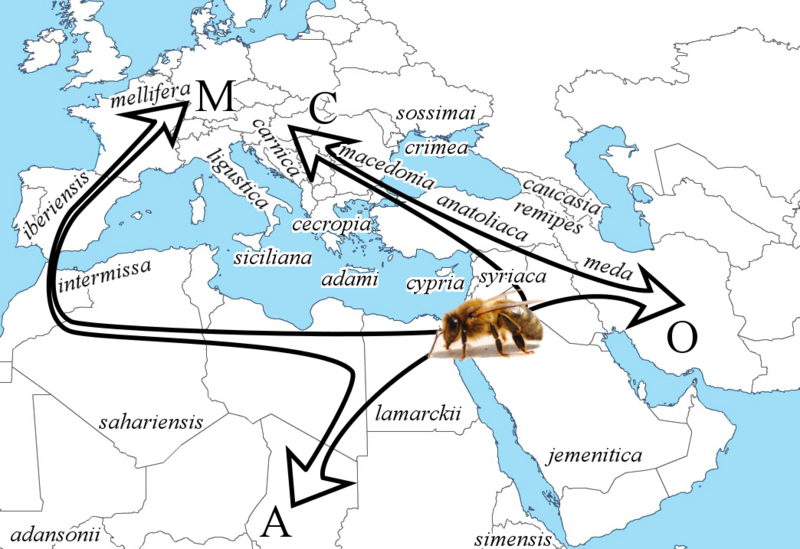 7Figure 1: The most likely hypothesis for the origin and expansion of Apis mellifera L. involves an origin in the Middle East, and an expansion via four distinct lineages, traditionally called A, M, C, and O (adapted from Han et al., 2012). The native areas of some of the subspecies are roughly located on the map for illustrating the geographical diversity. This list is non-exhaustive since the map does not cover the whole native distribution of A. mellifera. 8About 10,000 years ago, man was first a honey hunter for these subspecies, grabbing combs in wild colonies, mainly for honey and wax (Crane, 1999). Then, together with the development of new techniques, man progressively became a beekeeper, and then a bee breeder, who built new habitats, and became able to move colonies. The native distribution of subspecies remained relatively unchanged until then. However, since the beginning of the 17th century, the distribution of A. mellifera has drastically increased, as a result of man transporting colonies during his main migrations (Crane, 1999). Nowadays, the species A. mellifera is present on five continents, in regions marked by highly distinct environments and climate conditions. 9Besides natural selection pressures, human has contributed, deliberately or not, to shape the current diversity of honey bees worldwide. An exception to this statement is probably Africa. To date, the African continent remains indeed the last one owning a large and diverse wild population, including several subspecies and ecotypes. African honey bees are facing multiple threats, such as habitat loss, hunting, imported and local pests (reviewed by Dietemann et al., 2009). But overall, the African beekeeping industry is relatively undeveloped, and the human impact on the genetic diversity of African populations is probably very limited. The situation on the four other continents is completely different: the genetic diversity of their honey bee populations has been tremendously affected or even shaped by human factors, as detailed below. 10The native distribution of A. mellifera, as presented above, has been extended by human transportations of honey bee colonies. All A. mellifera subspecies can successfully interbreed. Therefore, when multiple subspecies come into contact, the situation inevitably results in the development of admixed populations, also called hybrids. This situation might happen between local and imported subspecies, or between multiple imported subspecies. Obviously, hybrids can also interbreed with other hybrids or with subspecies. In addition, some subspecies and hybrid populations have more desirable traits for the beekeeping industry, which resulted in the exponential growth of these populations, while others have been declining. Here, we briefly summarize what the situation is in both the native and non-native areas of A. mellifera subspecies. 11In the native area of lineages M, C and O (covering Europe, Middle East, and Western Asia), there is a wide range of subspecies and even more regional ecotypes. All these subspecies and ecotypes are characterized by local adaptations to their environment (Ruttner, 1988). However, their hybridization with managed non-native populations has largely increased due to beekeeping activities, such as migratory beekeeping and the international trade in queens and colonies (reviewed by De la Rúa et al., 2009). For example, A. mellifera mellifera populations (belonging to the M lineage) have been hybridized in varying degrees in most of their native areas (Cornuet et al., 1986; Garnery et al., 1998a, 1998b; Jensen et al., 2005). Several European countries have established protected areas for their A. mellifera mellifera populations (or what is left of them), as well as for other subspecies (Bouga et al., 2011). On the other hand, the two subspecies A. mellifera carnica and A. mellifera ligustica (belonging to the C lineage) have been intensively bred because of their desirable traits for beekeeping, such as high honey production and gentleness (reviewed by Lodesani et al., 2003). This latter review even claims that the native populations and regional ecotypes are considered extinct in many parts of Europe. 12In the Americas, Oceania, and a large part of Asia, honey bees are not native. Therefore, the genetic diversity of their honey bee populations initially depended on the original subspecies or hybrid populations from which colonies and queens have been imported (called a “source” hereafter). Obviously, the genetic diversity has then been affected by multiple factors. (1) The imported populations might interbreed if they are close to each other, resulting in the development of admixed populations. The admixture might also depend on the number of colonies and queens from each source (i.e. the proportion of each source). (2) Subsequent importations might modify the proportions of each imported source, or even bring a new source (i.e. from a subspecies or hybrid that has not been imported before). (3) The growth of each imported population might be affected by natural selection or by the preferential use of a certain subspecies or hybrid population for beekeeping. These three factors can be illustrated by historical examples. For instance, in the United States, the first imported colonies (in the early 1600s) belonged to A. mellifera mellifera, and formed the basis of feral and managed populations (reviewed by Sheppard, 1988). More than two centuries after, A. mellifera ligustica was introduced and gained popularity. Currently, the managed populations in the US are mainly hybrids derived from A. mellifera ligustica, A. mellifera carnica and minor contributions from other imported populations (Schiff & Sheppard, 1995; Wallberg et al., 2014). Moreover, the situation in North America is much contrasted regarding the importations. The USA produce a lot of queens domestically, while Canada mainly relies on queen importations from California, Hawaii, New Zealand, Australia and Chile (Parker et al., 2010).In South America, African honey bees (A. mellifera scutellata) have been imported once in 1956, and they hybridized with previously imported European subspecies populations, resulting in the development of a hybrid population, called “Africanized honey bees” (reviewed by Winston, 1992). These Africanized honey bees have now colonized most of South America, Central America, and even the south of the USA (Kono & Kohn, 2015). In Australia, commercial and feral honey bee populations are mainly hybrids from western and eastern European ancestry, that is coming from a mix of lineages M and C (Chapman et al., 2016). In central and eastern Asia, honey bee populations have also been repeatedly imported (Moritz et al., 2005), but it is unclear what their origins are, and what could be the current genetic diversity and admixture of their populations. 13From this, we can conclude that: (1) In areas where honey bees are native, the importation of non-native populations resulted in the hybridization of some subspecies and their regional ecotypes. (2) In areas where honey bees are not native, a large part of managed populations results from the admixture of multiple imported subspecies and hybrids. Hybrids with an eastern European ancestry (C lineage) are very common in these stocks. (3) The dynamic of imported populations can impact the genetic diversity of native subspecies and previously imported populations, through human management or natural selection. This fact has been illustrated by the preferential use of imported subspecies and hybrids over native subspecies, and the undesired development of Africanized honey bee populations. (4) This is an ongoing process; the international trade of queens and colonies is not going to stop in a near future. The proportion of admixed populations compared to native subspecies is likely to increase continuously. 14Honey bee subspecies and regional ecotypes are characterized by local adaptations to their respective environment (Ruttner, 1988). In parallel, the domestication leads to the selection of traits that enhance their production and survival under local conditions (Parker et al., 2010). Thus, the variation in phenotypes observed in managed populations is a result of both natural and artificial selection. 15In the USA, until recently, the genetic diversity of honey bee populations was assumed to be “reduced” compared to that of native European subspecies, (1) because of a bottleneck effect (Sheppard, 1988) and (2) because the North American breeding system relies on a restricted set of breeder queens (reviewed by vanEngelsdorp & Meixner, 2010). This latter review even included the assumed low genetic diversity as one of the factors affecting managed honey bee populations. However, this statement is unlikely to be true. Managed populations in North America have a genetic diversity similar or higher than European subspecies (Harpur et al., 2012; Wallberg et al., 2014). The reason seems that human management increases the genetic diversity through admixture (Harpur et al., 2012), even if it is probably unintentional. Moreover, the hypothesis of a bottleneck effect in the USA seems rather unlikely, given recent evidences showing that a very low number of colonies (or mated queens) is sufficient to reach the genetic diversity of parent populations. Indeed, Wallberg et al. (2014) demonstrated that Africanized honey bee populations have a genetic diversity similar to African subspecies, even if the variation originated from only 47 mated queens (Scott Schneider et al., 2004). The second hypothesis claiming that the number of breeder queens had an impact on the genetic diversity is also unfounded. In the USA, beekeepers commonly buy new queens to queen breeders to replace their old queens every one to two years to maximize egg production (Schiff & Sheppard, 1995). A few studies reported that the mean production per breeder queen, between 1994 and 2005, was 1,379 to 1,972 daughter queens (Schiff & Sheppard, 1995, 1996; Delaney et al., 2009). However, this approach consisting in producing 1,000,000 queens with as few as 500 breeder queens does not seem to affect the genetic diversity of honey bee populations in the USA (Delaney et al., 2009). In Australia, the situation is similar; a closed-population breeding program conducted over more than 25 years did not reduce the genetic diversity of the honey bee population (Chapman et al., 2008). There are multiple factors that can explain the fact that honey bee populations retain such high genetic diversity, besides strong selection pressures (reviewed by Harpur et al., 2012): (1) the honey bee mating biology, (2) the regular stock importations and (3) the colony density, combined with migratory beekeeping. All these factors lead to increase the admixture in managed populations, and therefore their genetic diversity. The extremely high rates of meiotic recombination, encountered in this species, is also likely to contribute to their genetic diversity (Wallberg et al., 2015). 16Beside the native subspecies, there are man-made populations that are phenotypically homogeneous regarding their apicultural traits (e.g. honey production, gentleness, etc. ), due to intensive selective breeding. The most striking example is the Buckfast breed, initiated by Brother Adam from Buckfast Abbey, Devon, UK (Adam, 1987). The Buckfast breed results from the interbreeding of multiple subspecies belonging to the four lineages (Österlund, 1983). Because of its complex admixture, this breed is not expected to have a low genetic diversity, even if the breed is genetically homogeneous. 17Currently, the apiculture also benefits of modern tools to perform artificial insemination (Cobey et al., 2013) and computing breeding values (Bienefeld et al., 2007), like for farm animals. The question whether or not these tools might affect the genetic diversity of managed stocks is difficult to address, because it depends on how these tools are used and generalized in apiculture (Bienefeld, 2016). For example, single drone insemination (which helps isolating a trait) reduces the genetic diversity within a colony, but this approach is rarely used, because it decreases the fitness and survival of colonies (e.g. Tarpy & Seeley, 2006; Mattila & Seeley, 2007). Globally, natural mating is still the norm in apiculture. 18From this part, we can conclude that the genetic diversity in managed stocks is not threatened by domestication, selection, and bottleneck effects. Human management might influence the variation of phenotypes, through artificial selection, but this will not result in a reduced genetic diversity. Increasing the admixture in native subspecies populations is generally undesired. Therefore, when these populations are endangered, the genetic diversity should be maintained in closed-population breeding programs, in protected areas. 19First, we illustrate here that, in honey bees, the difference between a wild population and a feral population might sometimes be confusing. In Africa, native subspecies mostly consist of wild populations, which have never been domesticated (Dietemann et al., 2009). In the Americas and Australia, the introduction of European subspecies led to the establishment of unmanaged populations found in the wild, and defined as feral populations, since they originated from domesticated stocks (Sheppard, 1988; Chapman et al., 2016). In Europe and Western Asia, there were wild populations of native subspecies, but in parallel several native subspecies have been domesticated and they generated feral colonies. Therefore both wild and feral populations can theoretically coexist in the wild, in Europe and Western Asia (Jaffé et al., 2009). However, it is unclear what could be the difference between a feral and a wild population belonging to the same subspecies, and located in the native area of this subspecies. Indeed, the domestication and the selection seem to have little effect on the genetic diversity of managed populations (Wallberg et al., 2014). Moreover, these feral and wild populations can interbreed, making them undistinguishable. Another issue is that the domesticated origin of a population found in the wild cannot be easily evaluated, because feral and wild populations might be genetically and phenotypically similar. In Europe and Western Asia, it seems that the difference between feral and wild populations of native subspecies is probably more related to semantics than to genetic and phenotypic differences. 20The interaction between a managed population and a feral (or wild) population might change the genetic diversity of both populations, through admixture for example (Harpur et al., 2012). Here, we show that human factors have led to the decline or development of several wild and feral populations. As a result, significant changes have occurred in the genetic diversity of several honey bee populations according to geographic regions and continents. 21Involuntarily, man is responsible for the demise of most wild and feral populations in Europe and in the USA. The introduction of the parasitic mite Varroa destructor, along with the human-mediated destruction of natural habitats, is probably the main factor explaining the demise of these populations (Kraus & Page, 1995; Moritz et al., 2007; Jaffé et al., 2009; Martin et al., 2012). Managed populations survive thanks to periodical acaricide treatments by beekeepers. A few surviving feral populations have been reported on both continents (Le Conte et al., 2007, Seeley, 2007). These populations are closely monitored to understand the mechanisms responsible for their tolerance or resistance against V. destructor. However, these surviving populations are an extremely scarce resource. As a result, the genetic diversity of honey bee populations in the USA and most European countries is almost limited to that of the managed populations. The feral and wild populations genetically differed from managed populations (Sheppard, 1988; Lodesani et al., 2003), and represented a source of genetic diversity and adaptations, which could also have benefited to managed stocks. In contrast, in Australia, Varroa mites have not been introduced yet (Heersink et al., 2016). Therefore, the feral population has not been wiped out like in the USA or Europe, and spread quickly across the country (Oldroyd et al., 1997; Chapman et al., 2016). After the introduction of A. mellifera mellifera (and perhaps A. mellifera iberiensis), several other subspecies have been introduced, including A. mellifera ligustica, A. mellifera carnica, and A. mellifera caucasica(reviewed by Chapman et al., 2016). Currently, both feral and managed populations are largely admixed (Chapman et al., 2008; Oxley & Oldroyd, 2009; Chapman et al., 2016). However, as shown in these studies, feral and managed populations are not identical. These populations probably experience different selection pressures. The genetic diversity within managed populations is likely influenced by artificial selection, with the goal to breed ‘pure subspecies’ for desirable apicultural traits (and therefore tend to limit the admixture). By comparison, the genetic diversity within feral populations is probably mainly driven by natural selection for traits that provide a better survival and fitness (Harpur et al., 2014). In addition, the interaction between feral and managed populations leads to constant exchange of genetic material through the reproduction. Therefore, this interaction is influencing the genetic diversity of both populations, and this will last until the human-mediated introduction of V. destructor. 22The development of Africanized honey bee populations represents another striking example that human actions can lead to reshape the genetic diversity of a whole honey bee population at a continent scale. The “process of Africanization” has been reviewed by Winston (1992). In 1956, African honey bees (A. mellifera scutellata) have been introduced to Brazil as an experimental population. In 1957, the swarms from multiple colonies accidently escaped into the wild, and interbreed with honey bees from European ancestry (belonging to the M lineage), forming the foundation of the Africanized honey bee population. This feral population quickly spread all over Latin America, and even reached the south of the USA (Kono & Kohn, 2015). As a result, the genetic diversity of local managed stocks has been largely impacted, because the queens mated with feral Africanized drones, and the colonies progressively became Africanized (Rangel et al., 2016). The success of this massive biological invasion mainly relies on an African ancestry (84%), but also on the contribution from the M lineage (15%) conferring adaptive advantages to Africanized honey bees (Nelson et al., 2017). Moreover, this new feral population is tolerant against V. destructor(e.g. Camazine, 1986; Martin & Medina, 2004; Medina-Flores et al., 2014), so that the only factor which seems to limit their current expansion is their wintering ability in temperate climate (Taylor & Spivak, 1984; Villa et al., 1991; Villa et al., 1993). However, the expansion of Africanized honey bees in North America is not finished yet (Kono & Kohn, 2015), and could even have the potential to reach the border with Canada (Southwick et al., 1990). Therefore, the genetic diversity of managed stocks in the USA is expected to get even more impacted than currently by the expansion of this new feral population. 23The socio-political and economic factors affecting the size of managed populations have been reviewed by vanEngelsdorp & Meixner (2010), with an emphasis on international trade and economics. These factors also influence the genetic diversity of both feral/wild and managed populations. Indeed, the international agreements about trade liberalization and trade restrictions are regulating the importations. And as illustrate in this review, the importations have an impact the genetic diversity and admixture of honey bee populations. 24As an example, the American Honeybee Act of 1922 restricted the importation of honey bees in the USA, in order to avoid the introduction of the tracheal mite (Acarapis woodi). Before 1922, at least eight honey bee subspecies were imported from Europe, the Middle East and Africa (reviewed by Cobey et al., 2012). During the period that followed, the genetic diversity of honey bee populations was therefore solely dependent on the previously imported stocks. Then, Italian type honey bees (C lineage ancestry) were massively imported from Australia, until 2011 when another ban was pronounced. The importations from Australia were also driven by an economic purpose, which was to meet the demand for the pollination of almond crops in the USA (Sumner & Boriss, 2006; Cobey et al., 2012). 25Socio-cultural factors might also have a deep impact on the genetic diversity of honey bee populations. For example, in Germany, the native population of A. mellifera mellifera has been almost replaced by A. mellifera carnica, because the local beekeepers decided to promote this imported subspecies (Lodesani et al., 2003). After 1946, the preference for A. mellifera carnica in Germany led to strong selective breeding efforts in order to reduce the hybridization with the local subspecies (Kauhausen-Keller & Keller, 1994; Maul & Hähnle, 1994). On the other hand, several European countries try to protect their native subspecies, or what is left of them (reviewed by De la Rúa et al., 2009). 26Admixed populations (also often called hybrids) can be considered as a source of “genetic pollution” in the context of protection of the native subspecies (Cornuet et al., 1986). There is an extended literature describing the need and the means to protect these subspecies, as valuable reservoirs of genetic diversity and local adaptations (e.g. De la Rúa et al., 2009; Dietemann et al., 2009; Meixner et al., 2010; Bouga et al., 2011). The conservation of all subspecies is indeed crucial, and more efforts should be dedicated to enhance the genetic diversity within each of these subspecies (Bienefeld, 2016). However, the admixed populations resulting from human management might have several evolutionary advantages, resulting from a high level of genetic diversity and novel-combinations, which have been largely neglected so far. 27Recent evidences showed that human management increases the genetic diversity of honey bee populations, through admixture (Harpur et al., 2012). The domestication of animals has often been associated with a loss of genetic diversity, but this latter study showed that it is the opposite in honey bees. Indeed, Harpur et al. (2012) demonstrated that the genetic diversity of current managed populations in Europe and North America, resulting from an admixture of C and M, was higher than the genetic diversity of the progenitor populations belonging to either C or M. This study generated a debate about the interpretation and generalization of their results (De la Rúa et al., 2013). However, the authors proved that their conclusions are accurate, and can indeed be generalized to other admixed populations (Harpur et al., 2013). This increase in genetic diversity due to the admixture of multiple subspecies was confirmed later on by Wallberg et al. (2014). 28The admixture of divergent intraspecific lineages leads to novel allelic combinations, which are unique opportunities for populations to respond to new selection pressures (reviewed by Rius & Darling, 2014). Selection can also act against admixed individuals, if these novel combinations do not provide an evolutionary advantage. In this latter review, several examples are given to illustrate the benefits and costs arising from admixture. Basically, the admixture can lead to short-term benefits (e.g. heterosis) and to long-term benefits (e.g. adaptations). The costs are usually associated to an outbreeding depression, which means that there is a loss of advantageous parental traits or a selective disadvantage of intermediate genotypes (Rius & Darling, 2014). In honey bees, the benefits and costs of admixture are poorly studied. In Europe, the native subspecies have a higher survival in their native area compared to non-native subspecies (Büchler et al., 2014). However, it remains unclear whether or not all admixed populations have a lower survival than their parent subspecies in these native areas. In areas where honey bees are not native, the example of the Africanized honey bees showed that their admixture may have facilitated the colonization of their new environment (Nelson et al., 2017). 29The genetic diversity within honey bee colonies affects their survival and fitness. The number of drones mating with the queen, and therefore the genetic diversity within a colony, influences multiple traits at the colony level. As examples, a higher genetic diversity was shown to help (1) preventing severe infections and promoting colony growth (Tarpy, 2003; Tarpy & Seeley, 2006); (2) increasing productivity and fitness (Mattila & Seeley, 2007); (3) regulating the nest temperature (Jones et al., 2004); and (4) ensuring colony survival (Tarpy et al., 2013). A high genetic diversity within a colony leads to an efficient “genetic task specialization”, and to the benefits mentioned above (Oldroyd & Fewell, 2007). Besides the number of drones mating with a queen, the admixture might also lead to an increased genetic diversity within a colony. Therefore, we think that it is worth studying the fitness and survival of admixed colonies, in order to know if selection might act in favor of these admixed colonies, especially in new environments (i.e. non-native areas). 30What about all these new human-mediated selection pressures? We mentioned above that the introduction of V. destructor likely contributed to the demise of several wild and feral honey bee populations (Kraus & Page, 1995; Moritz et al., 2007; Jaffé et al., 2009; Martin et al., 2012). This parasitic mite clearly represents a new selection pressure introduced by human management. Meanwhile, the genetic admixture leads to novel-allelic combinations, which do not exist in native subspecies, and which may increase the likelihood of the expression of new phenotypes (Suarez & Tsutsui, 2008). Here again, it is worth investigating if some of these new phenotypes might increase the resistance or tolerance against V. destructor. 31Honey bee populations are a crucial resource for worldwide agriculture and biodiversity. During the last decades, there has been an increasing demand for pollination services (Aizen & Harder, 2009), while in parallel honey bee populations have experienced severe declines in Europe and in the USA (vanEngelsdorp et al., 2009; Potts et al., 2010). In this context, the impact of human management on the genetic diversity of honey bee populations tends to be set aside. In this review, we illustrated how human management has contributed to reshape the diversity of honey bee populations worldwide, except maybe in Africa (Dietemann et al., 2009). We focused on four main factors. 32(1) The importations of honey bee colonies and queens are probably the factor which has the biggest impact on the diversity of these populations. Several native subspecies have been genetically admixed, and their conservation is constantly undermined by these importations (De la Rúa et al., 2009; Meixner et al., 2010). In areas where honey bees are not native, both feral and managed populations generally arise from the admixture of multiple imported subspecies (Sheppard, 1988; Chapman et al., 2016). In managed populations, hybrids with an eastern European ancestry (C lineage) are very common. 33(2) The domestication and selection does not reduce the genetic diversity of managed stocks. Quite the opposite, human management has increased the genetic diversity in honey bees through admixture (Harpur et al., 2012; Wallberg et al., 2014). 34(3) Involuntarily, man has also contributed to the decline or development of wild and feral populations. Because of their interaction with managed stocks, the feral and wild populations have an impact on the genetic diversity of both populations, through the reproduction. Two striking examples are: first, the decline of wild and feral populations in Europe and North America, likely due to the introduction of V. destructor(Kraus & Page, 1995; Martin et al., 2012), and second, the Africanization of managed stocks in the Americas (Rangel et al., 2016; Nelson et al., 2017). 35(4) Socio-political, economic, and cultural factors also affect the genetic diversity of honey bee populations. Indeed, the importations are regulated by international trade agreements and the legislation of each country (vanEngelsdorp & Meixner, 2010). The flow of importations may be driven by an economical need as well, such as meeting the demand for the pollination of almond crops for example (Cobey et al., 2012). A cultural preference for an imported subspecies with more desirable traits may also lead a country to give up on its native subspecies, such as illustrated by the replacement of A. mellifera mellifera by A. mellifera carnica in Germany (Lodesani et al., 2003). 36Overall, the proportion of admixed populations has continuously increased – and will likely keep increasing – compared to the proportion of native subspecies populations. More efforts should be dedicated to the conservation of these native subspecies, as they represent local reservoirs of genetic diversity and adaptations (De la Rúa et al., 2009). On the other hand, further investigations should focus on the evolutionary advantages of admixed populations. Their genetic admixture is associated to high level of genetic diversity and novel allelic combinations, which could be the key to respond to new selection pressures. 37This work was supported by the Walloon Region (Service Public de Wallonie) from Belgium, as part of the Selapis project, under grant D31-1328. Adam B., 1987. Beekeeping at Buckfast Abbey: Northern Bee Books. Aizen M. A. and Harder L. D., 2009. The global stock of domesticated honey bees is growing slower than agricultural demand for pollination. Current Biology, 19(11), 915-918. Allen-Wardell G., Bernhardt P., Bitner R., Burquez A., Buchmann S., Cane J., Cox P. A., Dalton V., Feinsinger P. and Ingram M., 1998. The potential consequences of pollinator declines on the conservation of biodiversity and stability of food crop yields. Conservation Biology, 12(1), 8-17. Arias M. C. and Sheppard W. S., 1996. Molecular Phylogenetics of Honey Bee Subspecies (Apis melliferaL.) Inferred from Mitochondrial DNA Sequence. Molecular Phylogenetics and Evolution, 5(3), 557-566. Bienefeld K., 2016. Breeding Success or Genetic Diversity in Honey Bees? Bee World, 93(2), 40-44. Bienefeld K., Ehrhardt K. and Reinhardt F., 2007. Genetic evaluation in the honey bee considering queen and worker effects - A BLUP-Animal Model approach. Apidologie, 38(1), 77-85. Biesmeijer J. C., Roberts S. P. M., Reemer M., Ohlemüller R., Edwards M., Peeters T., Schaffers A. P., Potts S. G., Kleukers R., Thomas C. D., Settele J. and Kunin W. E., 2006. Parallel Declines in Pollinators and Insect-Pollinated Plants in Britain and the Netherlands. Science, 313(5785), 351-354. Bouga M., Alaux C., Bienkowska M., Büchler R., Carreck N. L., Cauia E., Chlebo R., Dahle B., Dall'Olio R., De La Rúa P., Gregorc A., Ivanova E., Kence A., Kence M., Kezic N., Kiprijanovska H., Kozmus P., Kryger P., Le Conte Y., Lodesani M., Murilhas A. M., Siceanu A., Soland G., Uzunov A. and Wilde J., 2011. A review of methods for discrimination of honey bee populations as applied to European beekeeping. Journal of Apicultural Research, 50(1), 51-84. Breeze T. D., Vaissière B. E., Bommarco R., Petanidou T., Seraphides N., Kozák L., Scheper J., Biesmeijer J. C., Kleijn D., Gyldenkærne S., Moretti M., Holzschuh A., Steffan-Dewenter I., Stout J. C., Pärtel M., Zobel M. and Potts S. G., 2014. Agricultural Policies Exacerbate Honeybee Pollination Service Supply-Demand Mismatches Across Europe. PLoS ONE, 9(1), e82996. Büchler R., Costa C., Hatjina F., Andonov S., Meixner M. D., Conte Y. L., Uzunov A., Berg S., Bienkowska M. and Bouga M., 2014. The influence of genetic origin and its interaction with environmental effects on the survival of Apis mellifera L. colonies in Europe. Journal of Apicultural Research, 53(2), 205-214. Camazine S., 1986. Differential reproduction of the mite, Varroa jacobsoni (Mesostigmata: Varroidae), on Africanized and European honey bees (Hymenoptera: Apidae). Annals of the Entomological Society of America, 79(5), 801-803. Chapman N. C., Harpur B. A., Lim J., Rinderer T. E., Allsopp M. H., Zayed A. and Oldroyd B. P., 2016. Hybrid origins of Australian honeybees (Apis mellifera). Apidologie, 47(1), 26-34. Chapman N. C., Lim J. and Oldroyd B. P., 2008. Population Genetics of Commercial and Feral Honey Bees in Western Australia. Journal of Economic Entomology, 101(2), 272-277. Cobey S., Sheppard W. S. and Tarpy D. R., 2012. Status of breeding practices and genetic diversity in domestic US honey bees. Honey Bee Colony Health: Challenges and Sustainable Solutions CRC, Boca Raton, FL, 39-49. Cobey S. W., Tarpy D. R. and Woyke J., 2013. Standard methods for instrumental insemination of Apis mellifera queens. Journal of Apicultural Research, 52(4), 1-18. Cornuet J., Daoudi A. and Chevalet C., 1986. Genetic pollution and number of matings in a black honey bee (Apis melliferamellifera) population. TAG Theoretical and Applied Genetics, 73(2), 223-227. Crane E. E., 1999. The world history of beekeeping and honey hunting. London: Gerald Duckworth & Co Ltd.
De la Rúa P., Jaffé R., Dall'Olio R., Muñoz I. and Serrano J., 2009. Biodiversity, conservation and current threats to European honeybees. Apidologie, 40(3), 263-284. De la Rúa P., Jaffé R., Muñoz I., Serrano J., Moritz R. F. A. and Kraus F. B., 2013. Conserving genetic diversity in the honeybee: Comments on Harpur et al. (2012). Molecular Ecology, 22(12), 3208-3210. Delaney D., Meixner M., Schiff N. and Sheppard W., 2009. Genetic characterization of commercial honey bee (Hymenoptera: Apidae) populations in the United States by using mitochondrial and microsatellite markers. Annals of the Entomological Society of America, 102(4), 666-673. Delaplane K. S., Mayer D. R. and Mayer D. F., 2000. Crop pollination by bees: Cabi.Wallingford, Eng., New York: CABI Publishing. Dietemann V., Pirk C. W. W. and Crewe R., 2009. Is there a need for conservation of honeybees in Africa? Apidologie, 40(3), 285-295. Engel M. S., 1999. The taxonomy of recent and fossil honey bees (Hymenoptera: Apidae; Apis). Journal of Hymenoptera Research, 8(2), 165-196. Fries I., Imdorf A. and Rosenkranz P., 2006. Survival of mite infested (Varroa destructor) honey bee (Apis mellifera) colonies in a Nordic climate. Apidologie, 37(5), 564-570. Gallai N., Salles J.-M., Settele J. and Vaissière B. E., 2009. Economic valuation of the vulnerability of world agriculture confronted with pollinator decline. Ecological Economics, 68(3), 810-821. Garnery L., Cornuet J. M. and Solignac M., 1992. Evolutionary history of the honey bee Apis mellifera inferred from mitochondrial DNA analysis. Molecular Ecology, 1(3), 145-154. Garnery L., Franck P., Baudry E., Vautrin D., Cornuet J.-M. and Solignac M., 1998a. Genetic diversity of the west European honey bee (Apis melliferamellifera and A. m. iberica) I. Mitochondrial DNA. Genetics Selection Evolution, 30(1), S31. Garnery L., Franck P., Baudry E., Vautrin D., Cornuet J.-M. and Solignac M., 1998b. Genetic diversity of the west European honey bee (Apis melliferamellifera and A. m. iberica) II. Microsatellite loci. Genetics Selection Evolution, 30(1), S49. Gruber K., Schöning C., Otte M., Kinuthia W. and Hasselmann M., 2013. Distinct subspecies or phenotypic plasticity? Genetic and morphological differentiation of mountain honey bees in East Africa. Ecology and Evolution, 3(10), 3204-3218. Han F., Wallberg A. and Webster M. T., 2012. From where did the Western honeybee (Apis mellifera) originate? Ecology and Evolution, 2(8), 1949-1957. Harpur B. A., Kent C. F., Molodtsova D., Lebon J. M. D., Alqarni A. S., Owayss A. A. and Zayed A., 2014. Population genomics of the honey bee reveals strong signatures of positive selection on worker traits. Proceedings of the National Academy of Sciences, 111(7), 2614-2619. Harpur B. A., Minaei S., Kent C. F. and Zayed A., 2012. Management increases genetic diversity of honey bees via admixture. Molecular Ecology, 21(18), 4414-4421. Harpur B. A., Minaei S., Kent C. F. and Zayed A., 2013. Admixture increases diversity in managed honey bees: Reply to De la Rúa et al. (2013). Molecular Ecology, 22(12), 3211-3215. Heersink D. K., Caley P., Paini D. R. and Barry S. C., 2016. Quantifying the Establishment Likelihood of Invasive Alien Species Introductions Through Ports with Application to Honeybees in Australia. Risk Analysis, 36(5), 892-903. Hewitt G., 2000. The genetic legacy of the Quaternary ice ages. Nature, 405(6789), 907-913. Jaffé R., Dietemann V., Allsopp M. H., Costa C., Crewe R. M., Dall’Olio R., De La Rua P., El-Niweiri M. A. A., Fries I., Kezic N., Meusel M. S., Paxton R. J., Shaibi T., Stolle E. and Moritz R. F. A., 2009. Estimating the Density of Honeybee Colonies across Their Natural Range to Fill the Gap in Pollinator Decline Censuses. Conservation Biology, 24(2), 583-593. Jensen A. B., Palmer K. A., Boomsma J. J. and Pedersen B. V., 2005. Varying degrees of Apis melliferaligustica introgression in protected populations of the black honeybee, Apis melliferamellifera, in northwest Europe. Molecular Ecology, 14(1), 93-106. Jones J. C., Myerscough M. R., Graham S. and Oldroyd B. P., 2004. Honey bee nest thermoregulation: diversity promotes stability. Science, 305(5682), 402-404. Kauhausen-Keller D. and Keller R., 1994. Morphometrical control of pure race breeding in the honeybee (Apis mellifera L). Apidologie, 25(2), 133-143. Kefuss J., Vanpoucke J., Bolt M. and Kefuss C., 2016. Selection for resistance to Varroa destructor under commercial beekeeping conditions*. Journal of Apicultural Research, 54(5), 563-576. Kono Y. and Kohn J. R., 2015. Range and Frequency of Africanized Honey Bees in California (USA). PLoS ONE, 10(9), e0137407. Kraus B. and Page R. E., 1995. Effect of Varroa jacobsoni (Mesostigmata: Varroidae) on feral Apis mellifera (Hymenoptera: Apidae) in California. Environmental Entomology, 24(6), 1473-1480. Le Conte Y., de Vaublanc G., Crauser D., Jeanne F., Rousselle J.-C. and Bécard J.-M., 2007. Honey bee colonies that have survived Varroa destructor. Apidologie, 38(6), 566-572. Lodesani M. and Costa C., 2003. Bee breeding and genetics in Europe. Bee World, 84(2), 69-85. Martin S. J. and Medina L. M., 2004. Africanized honeybees have unique tolerance to Varroa mites. Trends in Parasitology, 20(3), 112-114. Martin S. J., Highfield A. C., Brettell L., Villalobos E. M., Budge G. E., Powell M., Nikaido S. and Schroeder D. C., 2012. Global Honey Bee Viral Landscape Altered by a Parasitic Mite. Science, 336(6086), 1304-1306. Mattila H. R. and Seeley T. D., 2007. Genetic diversity in honey bee colonies enhances productivity and fitness. science, 317(5836), 362-364. Maul V. and Hähnle A., 1994. Morphometric studies with pure bred stock of Apis melliferacarnica Pollmann from Hessen. Apidologie, 25(2), 119-132. Medina-Flores C., Guzmán-Novoa E., Hamiduzzaman M., Aréchiga-Flores C. and López-Carlos M., 2014. Africanized honey bees (Apis mellifera) have low infestation levels of the mite Varroa destructor in different ecological regions in Mexico. Genetics and Molecular Research, 13(3), 7282-7293. Meixner M. D., Costa C., Kryger P., Hatjina F., Bouga M., Ivanova E. and Büchler R., 2010. Conserving diversity and vitality for honey bee breeding. Journal of Apicultural Research, 49(1), 85-92. Moritz R. F., Härtel S. and Neumann P., 2005. Global invasions of the western honeybee (Apis mellifera) and the consequences for biodiversity. Ecoscience, 12(3), 289-301. Moritz R. F., Kraus F. B., Kryger P. and Crewe R. M., 2007. The size of wild honeybee populations (Apis mellifera) and its implications for the conservation of honeybees. Journal of Insect Conservation, 11(4), 391-397. National Research Council, 2007. Status of pollinators in North America. Washington, DC: National Academies Press. Nelson R. M., Wallberg A., Simões Z. L. P., Lawson D. J. and Webster M. T., 2017. Genomewide analysis of admixture and adaptation in the Africanized honeybee. Molecular Ecology, 26(14), 1-15. Oldroyd B., Thexton E., Lawler S. and Crozier R., 1997. Population demography of Australian feral bees (Apis mellifera). Oecologia, 111(3), 381-387. Oldroyd B. P. and Fewell J. H., 2007. Genetic diversity promotes homeostasis in insect colonies. Trends in Ecology & Evolution, 22(8), 408-413. Österlund E., 1983. Brother Adam and His Buckfast Bee. American Bee Journal, 123(2), 85-88. Oxley P. R. and Oldroyd B. P., 2009. Mitochondrial Sequencing Reveals Five Separate Origins of ‘Black’ Apis mellifera (Hymenoptera: Apidae) in Eastern Australian Commercial Colonies. Journal of Economic Entomology, 102(2), 480-484. Parker R., Melathopoulos A. P., White R., Pernal S. F., Guarna M. M. and Foster L. J., 2010. Ecological Adaptation of Diverse Honey Bee (Apis mellifera) Populations. PLoS ONE, 5(6), e11096. Potts S. G., Roberts S. P., Dean R., Marris G., Brown M. A., Jones R., Neumann P. and Settele J., 2010. Declines of managed honey bees and beekeepers in Europe. Journal of Apicultural Research, 49(1), 15-22. Rangel J., Giresi M., Pinto M. A., Baum K. A., Rubink W. L., Coulson R. N. and Johnston J. S., 2016. Africanization of a feral honey bee (Apis mellifera) population in South Texas: does a decade make a difference? Ecology and Evolution, 6(7), 2158-2169. Rius M. and Darling J. A., 2014. How important is intraspecific genetic admixture to the success of colonising populations? Trends in Ecology & Evolution, 29(4), 233-242. Ruttner F., 1988. Biogeography and taxonomy of honeybees. Berlin: Springer-Verlag. Schiff N. M. and Sheppard W. S., 1995. Genetic analysis of commercial honey bees (Hymenoptera: Apidae) from the southeastern United States. Journal of Economic Entomology, 88(5), 1216-1220. Schiff N. M. and Sheppard W. S., 1996. Genetic differentiation in the queen breeding population of the western United States. Apidologie, 27(2), 77-86. Scott Schneider S., DeGrandi-Hoffman G. and Smith D. R., 2004. The African honey bee: factors contributing to a successful biological invasion. Annual Reviews in Entomology, 49(1), 351-376. Seeley T. D., 2007. Honey bees of the Arnot Forest: a population of feral colonies persisting with Varroa destructor in the northeastern United States. Apidologie, 38(1), 19-29. Sheppard W. S., 1988. Comparative study of enzyme polymorphism in United States and European honey bee (Hymenoptera: Apidae) populations. Annals of the Entomological Society of America, 81(6), 886-889. Sheppard W. S. and Meixner M., 2003. Apis melliferapomonella, a new honey bee subspecies from Central Asia. Apidologie, 34(4), 367-375. Southwick E. E., Roubik D. W. and Williams J. M., 1990. Comparative energy balance in groups of africanized and european honey bees: Ecological implications. Comparative Biochemistry and Physiology Part A: Physiology, 97(1), 1-7. Suarez A. V. and Tsutsui N. D., 2008. The evolutionary consequences of biological invasions. Molecular Ecology, 17(1), 351-360. Sumner D. A. and Boriss H., 2006. Bee-conomics and the leap in pollination fees. Agricultural and Resource Economics Update, 9(3), 9-11. Tarpy D. R., 2003. Genetic diversity within honeybee colonies prevents severe infections and promotes colony growth. Proceedings of the Royal Society of London B: Biological Sciences, 270(1510), 99-103. Tarpy D. R. and Seeley T. D., 2006. Lower disease infections in honeybee (Apis mellifera) colonies headed by polyandrous vs monandrous queens. Naturwissenschaften, 93(4), 195-199. Tarpy D. R., vanEngelsdorp D. and Pettis J. S., 2013. Genetic diversity affects colony survivorship in commercial honey bee colonies. Naturwissenschaften, 100(8), 723-728. Taylor O. R. and Spivak M., 1984. Climatic limits of tropical African honeybees in the Americas. Bee World, 65(1), 38-47. The Honeybee Genome Sequencing Consortium, 2006. Insights into social insects from the genome of the honeybee Apis mellifera. Nature, 443(7114), 931-949.
vanEngelsdorp D., Hayes J., Jr., Underwood R. M. and Pettis J., 2009. A Survey of Honey Bee Colony Losses in the U.S., Fall 2007 to Spring 2008. PLoS ONE, 3(12), e4071. vanEngelsdorp D. and Meixner M. D., 2010. A historical review of managed honey bee populations in Europe and the United States and the factors that may affect them. Journal of Invertebrate Pathology, 103, S80-S95. Villa J. D., Koeniger N. and Rinderer T. E., 1991. Overwintering of Africanized, European, and hybrid honey bees in Germany. Environmental Entomology, 20(1), 39-43. Villa J. D., Rinderer T. E. and Collins A. M., 1993. “Overwintering” of Africanized, European, and Hybrid Honey Bees (Hymenoptera: Apidae) in the Andes of Venezuela. Environmental Entomology, 22(1), 183-189. Wallberg A., Glémin S. and Webster M. T., 2015. Extreme Recombination Frequencies Shape Genome Variation and Evolution in the Honeybee, Apis mellifera. PLoS Genet, 11(4), e1005189. Wallberg A., Han F., Wellhagen G., Dahle B., Kawata M., Haddad N., Simões Z. L. P., Allsopp M. H., Kandemir I. and De la Rúa P., 2014. A worldwide survey of genome sequence variation provides insight into the evolutionary history of the honeybee Apis mellifera. Nature Genetics, 46(10), 1081-1088. Wallberg A., Schöning C., Webster M. T. and Hasselmann M., 2017. Two extended haplotype blocks are associated with adaptation to high altitude habitats in East African honey bees. PLOS Genetics, 13(5), e1006792. Whitfield C. W., Behura S. K., Berlocher S. H., Clark A. G., Johnston J. S., Sheppard W. S., Smith D. R., Suarez A. V., Weaver D. and Tsutsui N. D., 2006. Thrice out of Africa: ancient and recent expansions of the honey bee, Apis mellifera. Science, 314(5799), 642-645. Winston M. L., 1992. The biology and management of Africanized honey bees. Annual Review of Entomology, 37(1), 173-193. Gil Leclercq, Nicolas Gengler & Frédéric Francis, «How human reshaped diversity in honey bees (Apis mellifera L.): a review», Entomologie faunistique - Faunistic Entomology [En ligne], Volume 71 (2018), URL : https://popups.uliege.be:443/2030-6318/index.php?id=4050.